The mobiREPORT app is a new, easy-to-use mobile phone application designed to help report the news as it happens. The reported news now contains rich media information associated with the story including a geo positioned map and accurate related weather data from the exact location provided by weathertrends360.com. 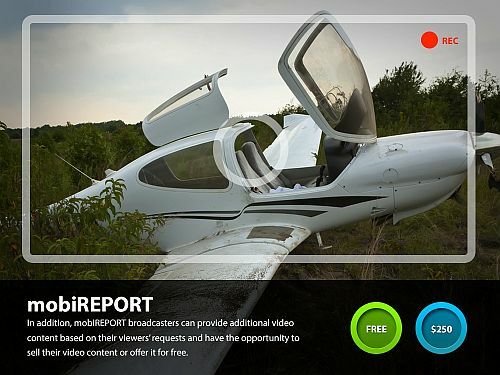 The mobiREPORT app enables the viewers of the content to interact with the creator of the news report in real time. For example the viewer can request additional details from the reporter so that the content viewed becomes exactly what the audience wants to see. By providing the instantaneous collaboration between the viewer and the reporter, mobiREPORT empowers the content creative process to be exactly what the audience wants to see. The system automatically tracks and averages how much the audience likes the story with a rainbow color gradient scale instantly from the viewing public. The service is available globally and is designed to create an immediate interaction and collaboration between the content creator and the viewing audience. By "following" a reporter his or her news stories the viewer is instantly notified as soon as the reporter posts a new news story. The site effectively connects and engages the viewers with the reporter as news happens. The site is accessible from a PC, iPhone or iPad as well as all smart phones with internet access. A business owner captures a video of the devastation from a recent storm on his cell phone as it happens. The pictures and videos can now be uploaded directly from the phone with related geo positioned information and weather related data pinpointing the exact location from where the pictures and videos were taken. The viewers worldwide get an instant notification and the latest breaking news update based on a location when and where the video is posted from. The followers of the person reporting the news also get a push notification/text message to their phone when the new story is uploaded. The reporter can instantly receive feedback from the viewers requesting more video or pictures from the area or additional details from the video that was posted showing the submerged ATM in the subway station in New York. As soon as the viewing public requests the additional detailed reporting on a specific location the reporter can return or geo targeted location in question and record additional footage to post for the viewers. The date, time, location and related weather data including barometric pressure, wind, temperature are all associated with the news story accurately pin pointing the location of the area shown and related latitude and longitude coordinates are posted with the video. The pictures and content can be password protected and also sold to the news and media through the portal. The mobiREPORT system makes it possible to report anything the public wants to see or is willing to pay for, and provides an easy-to-use tap and touch interface that enables both iPhone and iPad content creation with narrated and accompanied text typed by voice using the built in Siri™ engine. It has a user-friendly and intuitive interface which can enable the phone or iPad camera to be used to shoot and upload pictures and videos in real time or enables the reporter to choose from the videos and pictures saved on the phone or iPad photo album. All data is stored on mobiREPORT's secure servers and is accessible from any internet connection. 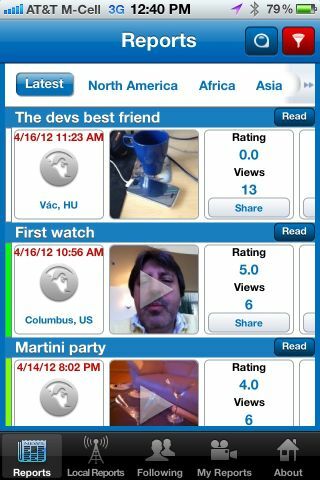 The mobiREPORT app (https://itunes.apple.com/ao/app/mobireport/id540373896?mt=8) works internationally and requires no specialized equipment, servers or plugins to be viewed. 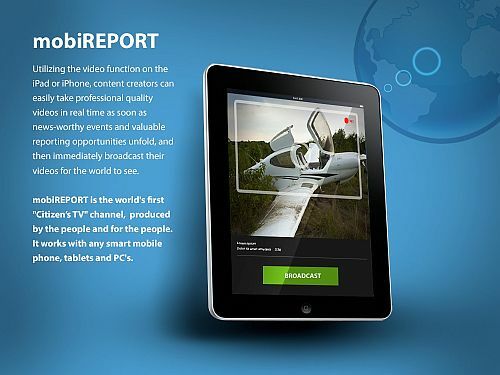 MobiREPORT can be viewed from any browser on a PC, iPhone or iPad as well as other smart phones and android tablets are supported in support of a broad viewing audience. "We designed mobiREPORT to be a cost effective, simple alternative to lugging around camera equipment that could draw unwanted attention to a news crew. The mobiREPORT portal is designed to enable everyone to share news with the world as it happens, said Mobius CEO Aram Kovach. “It eliminates the need for expensive cameras and reduces the cost associated with travel especially for camera crews and equipment, while providing an inexpensive and convenient way for information to reach a broad worldwide audience. The audience has the ability to filter news and information based on geography or specific interests. mobiREPORT provides an easy of use and a convenience that helps reduced travel budgets for camera crews and reporters while empowering a single individual to record report and engage a worldwide audience: Whether it's a reporter working for a major news network or just a person with an unfortunate happenstance that found himself in the eye of the storm providing a unique perspective. MobiREPORT servers the basic need of the public by engaging them to view the news when and where it's convenient. This makes the business of reporting news less expensive, faster and more efficient"
The mobiREPORT.mobiusworld.me portal and app is part of the growing Mobius family of mobile phone products and services, including mobiPET, mobiLUX, mobiSHADES, mobiBIZ, mobiWINE, mobiTURF, mobiTWIN, mobiKIDS, mobiCARD, mobiART, mobiDENT, mobiREALTOR, trustPRODUCE and mobiLEGACY. Visit www.mobiworld.me to learn about everything mobi and to explore your mobile marketing opportunities that engage an audience for the action of texting a picture. Mobius Is a Brand Extension Mobile Engagement Platform. Anything you can take a picture of we can respond to, and capture your complete mobile profile in real time.